Core courses are taken during the first year of the graduate program. The faculty of the Microbiology Graduate Group believes there is a common body of fundamental knowledge in the discipline of microbiology that all students should master prior to obtaining a graduate degree. A competent, independent investigator must be familiar with the microbiology literature, recognize meaningful questions, and have the ability to communicate, both in written text and orally, the results and conclusions of those experiments. We have designed a graduate curriculum with the express purpose of assisting the student in meeting these goals. The core courses are team taught by faculty members of the group on a rotational basis. 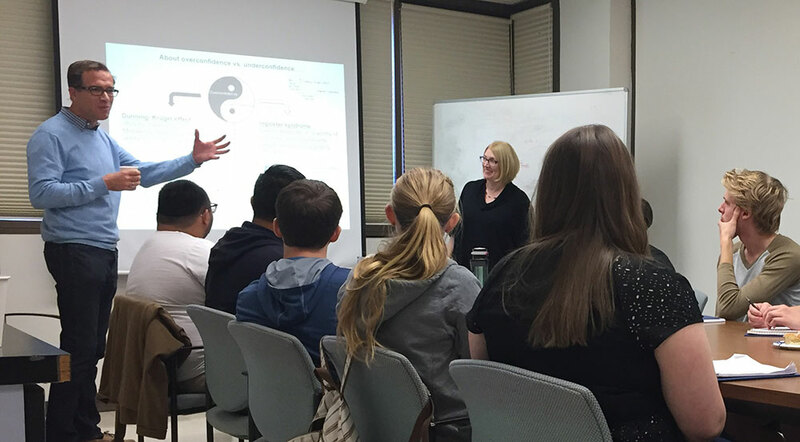 The formal lectures are accompanied by seminar-discussions during which students analyze critically classic and current research reports appropriate to the lecture topic. In addition, students are encouraged to attend and participate in the weekly Work-In-Progress Seminars (MIC 291, 1 unit, taken each quarter). These are seminars in which graduate students and postdoctoral fellows have an opportunity to present their research. Finally, throughout the Ph.D. program, students are encouraged to attend weekly seminars given by outstanding scientists from throughout the country, sponsored by the Section of Microbiology, the Division of Biological Sciences and other departments affiliated with the group. Special Thanks to Dr. Tsolis and Dr. Saeij for teaching the Rotations Course in Fall 2017 (Photo by Jessica W. Toan).